Named after a massacre of ethnic Szekelys by Habsburg Austrian soldiers in 18th century. Existing for more than a dozen years but refusing to give interviews. 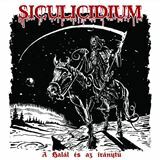 Siculicidium, hailing from an ethnic Hungarian area in Romania, are truly a cult entity. Add to the fact that Transylvanian black metal (Negura Bundet) is legendary, and I was very much interested in hearing a brand new EP from this heretofore unknown to me band. Donâ€™t expect folky atmospherics from A halal es az iranytu. Donâ€™t let melodic acoustics opening A halal fool you. There is darkness lurking here, no wonder A halal means â€œdeathâ€. One minute into the song a harsh guitar tone emerges and drives the composition throughout. Booming drum comes in support and helps to form a massive sound foundation of Siculicidium. Towering vocals sit above the unrelenting muscular, almost physically mauling experience. Some interesting instrument (trumpet?) emerges as a lead underneath this gigantic blackened slab, but the best epithet to describe A halal is grim. As it probably should be. Az iranytu (meaning â€œcompassâ€) does not really provide an easy path out either. The same thick guitar tone dominates, only drums are now less booming, more punky in approach. Mid-way breakdown is an unexpected snappy prog, trance inducing jangly sound provided by Jewâ€™s harp. Less grim and more weird pagan ceremony Az iranytu complements A halal in an interesting and somewhat unexpected way.